In June of 1964, three idealistic young men (one black and two white) were lynched by the Ku Klux Klan in Mississippi. They were trying to register African Americans to vote as part of the Freedom Summer effort to bring democracy to the South. 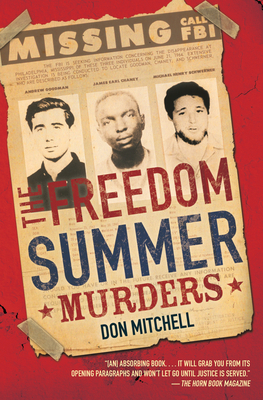 Their disappearance and murder caused a national uproar and was one of the most significant incidents of the Civil Rights Movement, and contributed to the passage of the Civil Rights Act of 1964.The Freedom Summer Murders is the first book for young people to take a comprehensive look at the brutal murders of James Chaney, Andrew Goodman, and Michael Schwerner, through to the conviction in 2005 of mastermind Edgar Ray Killen. Don Mitchell is the author of several critically acclaimed nonfiction books for young people, including The Freedom Summer Murders, which received multiple starred reviews and was an NAACP Image Award Nominee, a finalist for the Cybils Award, and a Kirkus Prize finalist in the Young Readers' Literature; Liftoff: A Photobiography of John Glenn; and Driven: A Photobiography of Henry Ford. Don is passionate about bringing history to life for young readers.